Ever since I was a little girl, my journal has been my closest companion. In those early golden years of childhood, it was a place to draw, describe my day, and try my hand at poetry. Later it would be my sanctuary to unload teenaged angst on my long daily bus commute to and from school. In my early adult years, the pages were filled with dreams and affirmations for what I wanted my life to be. I recorded my challenges and celebrations and I did not know it at the time but in many ways my younger self created the life I enjoy now. That is how powerful journal writing is. I have kept all these journals and it is interesting to once in awhile peruse some of them. I had an “aha” moment recently and discovered a common thread in my decades of journal writing: courage. That is, my journals helped me discover my courage over the years. When I was little, my journal (I called it my diary back then) encouraged me to explore my creativity and it gave me a place to safely ask the questions about life that my inquisitive young mind had at the time. On my two- hour long bus commute to high school on the other side of the island (I lived on Oahu and my school was very far away from our home) I wrote down my hopes and fears about life, and the anguish a 15- year old girl feels when her crush does not know she even exists. Throughout adulthood, my journal got me through entry-level jobs, buying my first house, having my babies, the challenges of being a stay at home mom in rainy Seattle, my divorce, my recreating myself (more than once), adventures, and professional aspirations. When I turned 50 two years ago, I decided that I would focus on courage. I had purchased a brand- new journal (of course I did. LOL) for my big birthday. 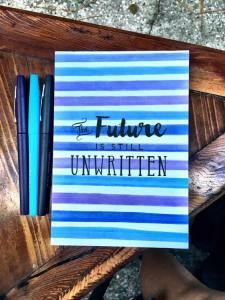 The cover of it read: “The Future is Still Unwritten”. I had around that time come across a quote by the late Steve Jobs who had given a speech at the commencement ceremony of Stanford University in 2005. That just really resonated with me as I processed arriving at the big 5-0 and standing atop that mountain and looking down over the valley of my life. What did I want the rest of my life to be about? The answer: COURAGE! I wrote that Steve Jobs quote down on a sticky note and I have it on the inside cover of this very special journal (which I now take with me to public speaking engagements to inspire others). The root word of courage is “heart”. 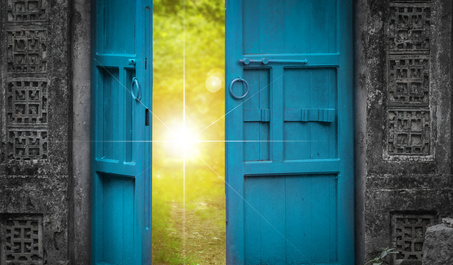 Courage is about connecting with our heart space. My “aha” moment that I mentioned a few paragraphs ago is this: throughout my entire life, my journal writing has connected me to my heart. It was always the place that I could be my authentic self, share my heart’s stirrings and sorrows, aspirations, and blessings. My journal never judged me. I felt safe. On the pages of my journal, I could be naked. Presently, my journal is helping me to have the courage to leave the legacy that I wish to create: to help other women discover their courage in order to live the most confident and joyful life possible. Nowadays, my writing pages may be filled with ideas for my Courageously Go! podcast and blog, books, and online courses to empower women. A big component of anything I offer to other women is (can you guess)? – encouraging them to write. Write, write, and write some more! At age 52, these writing pages are also filled with my dreams, space for drawing and poetry, joys and sorrows, and memoirs of exciting travels and adventure (just as they were in my earlier years). My journal has always been there for me. It has always encouraged me to just be myself- in the heart space. That is COURAGE. 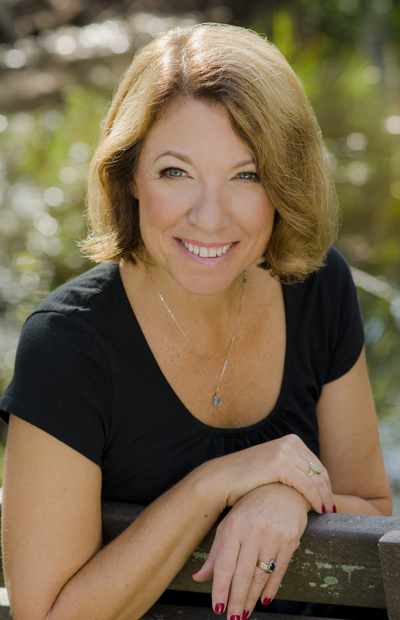 Debbie DiPietro is the host of the popular podcast for women, Courageously Go! where her mission is to have a global conversation about courage. You can listen to her show on iTunes, iHeartRadio, Spotify, Spreaker, and many other outlets. She is also in the process of launching her College of Confident Living where she (and other awesome instructors from around the world) will be offering online courses and challenges to help women live the most confident life possible (yes, there will often be a journal writing component to these offerings). You may learn more about her work at her website CourageouslyGo.com. If you want to learn how journaling can help you tackle life's challenges and help you find your courage, please download the free eBook, The Journaling Guide to Manage The Stress and Strains of Life. Who am I? It's a powerful question, but doesn't have one simple answer. 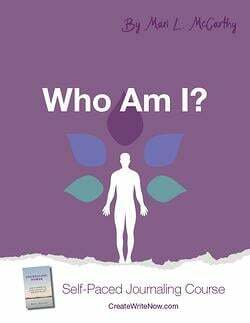 Become more self-aware and unlock your true potential with our self-paced journaling course, Who Am I?